ELLENVILLE, NY (September 19, 2012) – Shadowland Theatre in Ellenville has once again ended their season with a bang, and this time it’s electric. “The Dangers of Electric Lighting” by Ben Clawson is a historical drama that tells the story of the “War of Currents,” in the 1880s. Mild-mannered, but brilliant Nikola Tesla (Andrew Sellon) arrives from Croatia at the lab of bigger-than-life Thomas Alva Edison (James Glossman), with a glowing recommendation from Charles Batchelor (Michael Rhodes), a former Edison employer. Edison hires Tesla, who boasts that he can run Edison’s dynamos on Alternating Current (AC). Although he succeeds, Edison reneges on his promise to pay Tesla $50,000, saying that the foreigner does not understand the American concept of a joke. The two men part company. Thus begins the war. Edison, a proponent of Direct Current (DC) believes that AC is dangerous and embarks on a vicious and disquieting smear campaign against Tesla and his AC. Edison engages Harold Brown (Mark McCarthy), who has written a letter to the editor of the New York Post, to conduct experiments proving the dangers. In the meantime, Tesla secures the backing of George Westinghouse (Steve Brady), along with a lucrative contract. 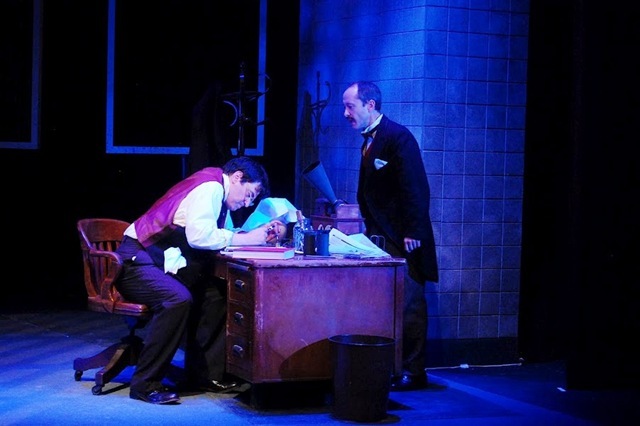 The performances in “The Dangers of Electric Lighting” live up the plays title. Every single one is electric! Andrew Sellon as Tesla is restrained, formal, tenacious and passionate about his art, operating on the moral high ground. Impeccably dressed in contrast to Edison’s slovenliness, Sellon’s Tesla is the sophisticated and knowledgeable underdog. The the audience’s empathy for Tesla is palpable. 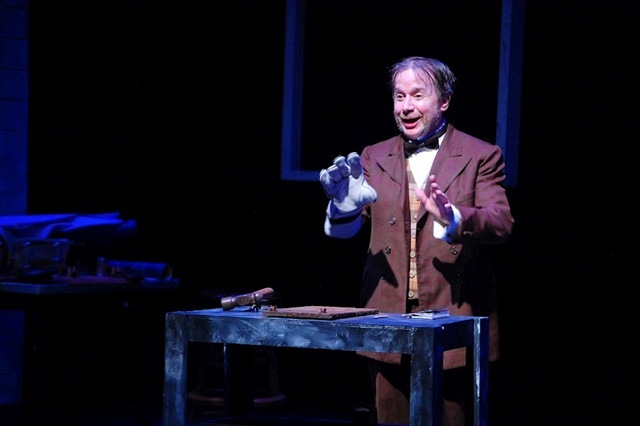 James Glossman, who originated the role of Thomas Edison when the show was first presented by Luna Stage in West Orange, NJ, home of Edison’s lab, and who won a New Jersey Tony Award for his portrayal, plays the perfect Edison – swaggering, egotistical, fast-talking, loud and brash. He is overbearing and conceited, and at turns, ugly. The “Wizard of Menlo Park” is the inventor you love to hate. Steve Brady’s Westinghouse is the consummate businessman, sharp and definitive and, doubling as Benjamin Franklin, he is wise and fatherly. And Brady has some lightning-fast costume changes that left me breathless. 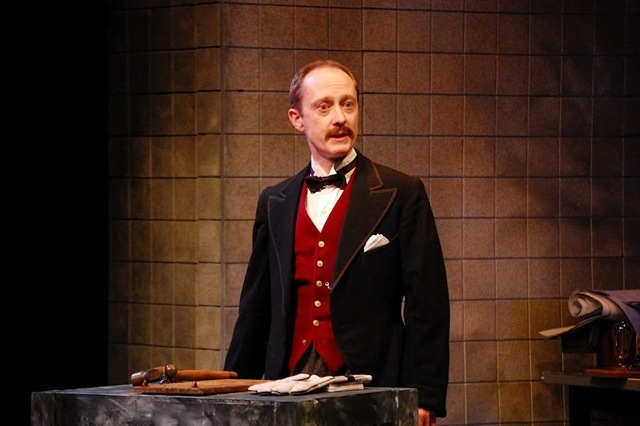 As Harold Brown, Mark McCarthy has a thankless task, which he performs admirably. His Brown is a slick salesman, a slimy weasel, adroitly capable of taking on Edison’s assignment to prove the dangers of AC current. His is not a sympathetic character, but McCarthy performs the part with aplomb. Bravo! Michael Rhodes as Charles Batchelor, a.k.a. “Batch,” plays an attractive devil’s advocate. Torn between his loyalty to Edison and his knowledge that Edison is wrong in his ideals and ideas, Rhodes clearly shows the character’s humanity. “The Dangers of Electric Lighting” is superbly directed by Shadowland’s Producing Artistic Director, Brendan Burke. Drew Francis’ set is first rate, complete with glowing electrical pieces, Edison’s messy desk and a small screen above the stage used to illustrate the time period and even an Edison movie. Perfect period costumes are designed by Holly Lewis Budd, and Jack Wade’s lighting capably portrays the dark mood of the play. 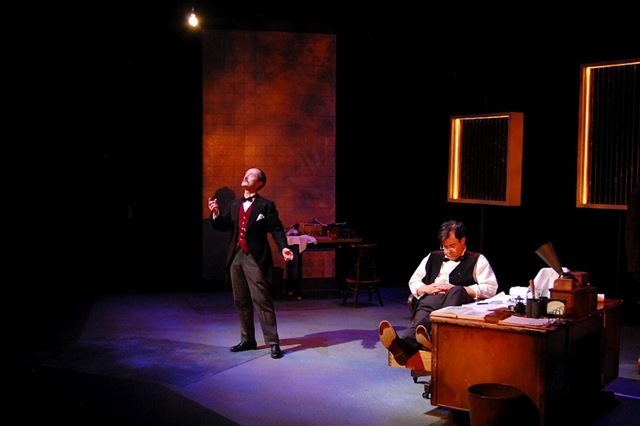 “The Dangers of Electric Lighting” at Shadowland Theatre is as brilliant as the illumination emanating from a light bulb powered by Tesla’s Alternating Current. 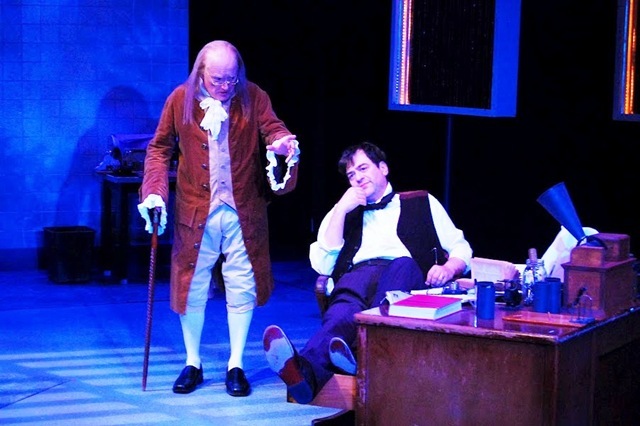 The play can be seen through September 30, 2012 on Thursday, Friday and Saturday at 8:00 p.m. and Sundays at 2:00 p.m. The Shadowland Box Office can be reached at 845-647-5511.